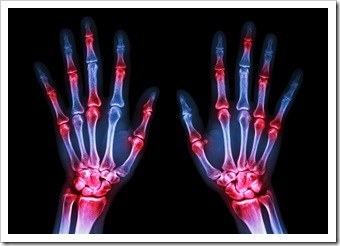 Read Are You Suffering From Rheumatoid Arthritis? by Dr. Paul Miller to learn more about Advanced Chiropractic and our Chiropractic office in Spokane, WA. For decades, arthritis was considered an inherent part of the aging process and a signal to a patient that it’s time to slow down. But not anymore. Surprisingly recent research points out that people much younger can develop rheumatoid arthritis pain but the best news is that people no longer need to suffer needlessly from the pain. Recent research and clinical findings show that there is much more to life for arthritis patients than the traditional recommendation of bed rest and drug therapy. The word “arthritis” means “joint inflammation” and is often used in reference to the pain affecting a certain part of the body, for example, the neck or low back. Recent studies indicate that arthritis and arthritic pain do effect up to 80% of people over 50 years of age, but not all. Tender, warm, and swollen joints. Fatigue, sometimes with fever, and a general sense of not feeling well. Pain and stiffness that lasts for more than 30 minutes after a long rest. The condition is symmetrical. If one hand is affected, the other one is, too. Although the wrist and finger joints closest to the hand are most frequently affected, neck, shoulder, elbow, hip, knee, ankle, and feet joints can also be affected. The disease can last for years and can affect other parts of the body, not only the joints. Rheumatoid arthritis is also highly individual. Some people have mild arthritis that lasts from a few months to a few years and then goes away. Mild or moderate arthritis sufferers have periods of worsening symptoms (flares) and periods of remissions. Finally, people with severe arthritis can feel the pain most of the time. The pain could last for many years and can cause serious joint damage and disability. As spinal and musculoskeletal specialists, we look at x-rays every day. What we observe is that arthritis often develops in areas where there have been misalignments or areas where trauma has occurred and left untreated over a long period. For instance, if you suffered back or neck pain from a car accident, sporting injury, or even held an improper posture at work for a long period, over the years that area of the body can and will degenerate and your bodies protective mechanism of swelling, arthritis, in time will result. With the traditional treatments of rheumatoid arthritis, anti-inflammatories are most frequently prescribed to patients. Unfortunately, these medications are often linked to dangerous side effects such as blurred vision, increased blood pressure, digestive ulcers and bleeding, kidney problems, dizziness and even possibly death. Chiropractic care is a safe and natural approach that addresses the body as a whole system. This whole body approach incorporates exercise, nutrition, along with function and mobility for the best and most long lasting maintainable results. Rheumatoid arthritis requires rehabilitation programs that cater to the specific needs and a long-term approach. Patience is required for these rehabilitation programs, and it is essential to remember that the problem has developed over a period of years and will not be fixed in a matter of weeks or months. Progress should be reached in the short-term, but such situations usually require consistent, ongoing attention to achieve the long-term solution. Applying the appropriate rehabilitation program to this degenerative condition is essential, and chiropractic care can be of great assistance in achieving the maximum rewards from a rehabilitation program. By enabling the highest mobility of the spine and maximum function of your nervous system, regular chiropractic care’s strategic goal is to not only restore function but to revitalize the health of the entire body. What Makes Our Team Special? Our team specializes in techniques and treatments that address the cause of the arthritic pain directly rather than just masking the symptom of the inflammation. Furthermore, our expert team has been uniquely formulated to bring together the right combination of knowledge, techniques, and support to help you and your family members. Not only will we help you achieve health and wellness with reducing and eliminating pain but also help future generations learn to be pro-active and avoid degenerative processes like arthritis to allow them to enjoy the activities that they desire their entire lives fully! This entry was posted on Tuesday, May 9th, 2017 at 2:55 pm and is filed under Health Articles. You can follow any responses to this entry through the RSS 2.0	feed. You can skip to the end and leave a response. Pinging is currently not allowed.